The mascot for my new school is the “lightning bolt”–kind of unusual, I know. 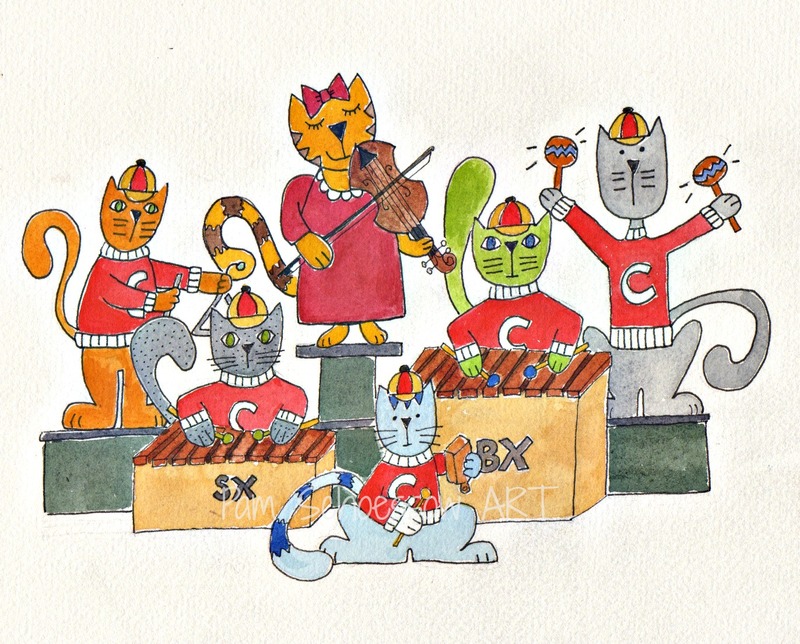 So I have been designing a school music website and have painted some things to go on it. I thought some instruments in the shape of a lightning bolt would be fun. Here’s another. It was easy to frame them in Picmonkey. 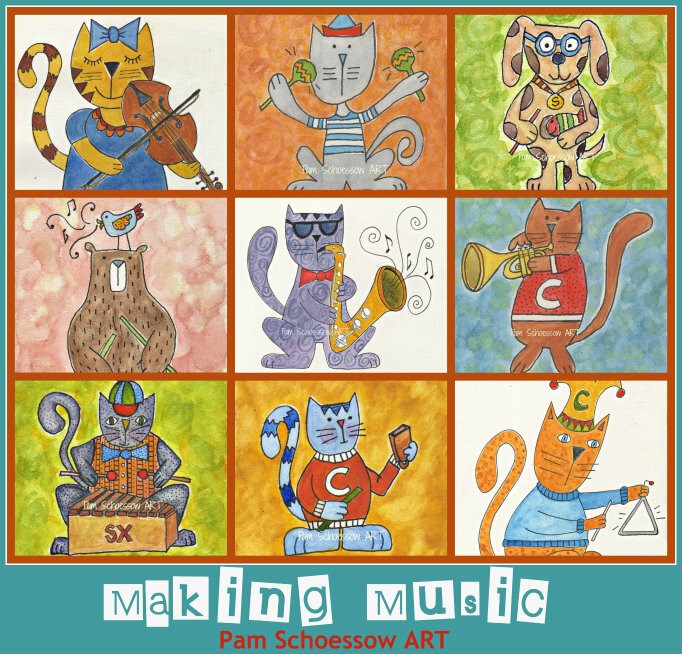 Before I ventured into art, I taught elementary music. 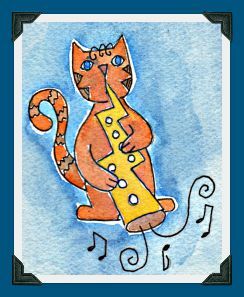 I am a proponent of the “Orff” method of music education which combines movement, percussion instruments, speech and song. I completed my 3rd level of Orff training (named for Carl Orff, a German composer) last summer and now I am Orff certified! Making music with kids is quite fun. 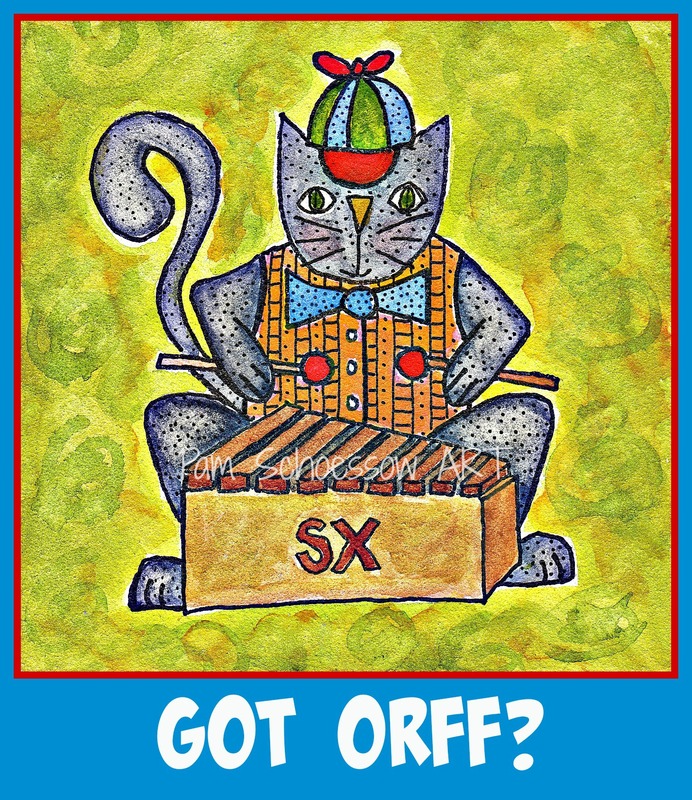 I made this little poster for music teachers who are also into “Orff”. 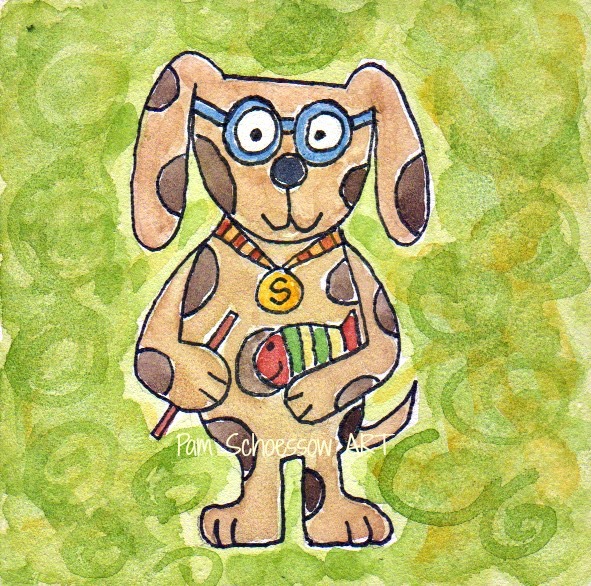 You can find it in my Teachers Pay Teachers store, “Classroom Doodles”, here. For you Orff teachers out there. Violet is back, but now she has a backup band! The Cat Fraternity Percussion Ensemble is pleased to perform with her. That’s Tori on triangle, Milo on maracas, Connor on cowbell, Sheldon on soprano xylophone, and new comer Bob on bass. They are having a great time playing this gig. He likes at add a little Latin flair! Don’t know what a guiro is? This is what Wikipedia says: The güiro (Spanish pronunciation: [ˈɡwiɾo]) is a Latin-American percussion instrument consisting of an open-ended, hollow gourd with parallel notches cut in one side. It is played by rubbing a stick or tines along the notches to produce a ratchet-like sound. Guiros made for children are usually made of wood and are painted with red and green. Kids sometimes refer to it as the “fish”. I couldn’t resist making a small collage of my Making Music series. I will make one at the end of this challenge with all 30 paintings, but here is a sneak peak. I made this collage in Ipiccy.